Honey Boo Boo proved her personality is far from pint sized on last night’s episode of Jimmy Kimmel. Seven-year-old Alana Thompson was unable to contain her excitement and boredom during the nine minute segment, which she appeared on with her mother, June Shannon. 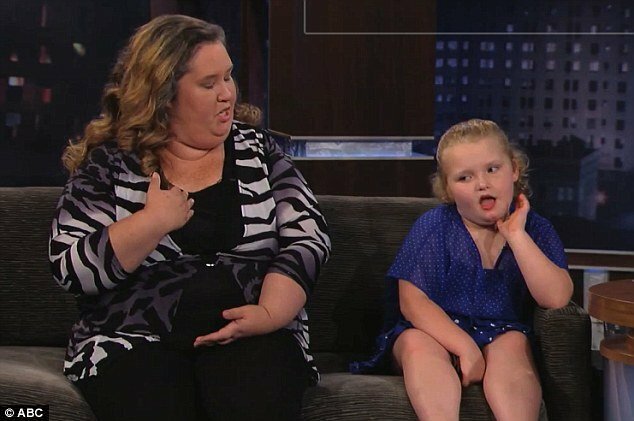 While uncontrollably wriggling, Honey Boo Boo endorses Barack Obama, admits she once had a stutter and discusses her allowance; while mother June Shannon reveals how all the money made from the show is split equally between the children in a trust fund. Meanwhile, they youngster decides to have a quick nap, resting her head in her arms, but not before shoving her hand in Jimmy Kimmel’s glass of water and then flicking it at the audience. Earnestly, Mama replied: “No, we just started out, you don’t make millions when you first start out. “I am the manager, the agent in all of this. I know what’s best for my kids… that’s why I chose to put money in the trust fund. “This journey may last six months or it may last a year but I don’t want ten years down the road Alana or any of the kids to be thinking, <<oh my god, I have nothing to show for it>>. So I wanted to put it in a trust fund, split equally for all the kids. Honey Boo Boo says she doesn’t get her own allowance just yet, but that Mama gives her money to go to the store. “Like if I wanna go to the store, she gives me my own money. I buy some candy or somethin’, or somethin’ to eat,” she said. On her nickname as “coupon queen”, June Shannon admitted: “Unfortunately because we’ve had a busy schedule I don’t get to coupon as much as I used to, but when I do get to coupon… oh boy. Jimmy Kimmel pointed out the family’s other nickmanes, like Chubs, Sugar Bear and Pumpkin. Honey Boo Boo offered: “I have other nicknames, one’s Smoochi and one’s T.T. Jimmy Kimmel turned the focus to politics, telling the mother-daughter duo that Republican presidential candidate Mitt Romney recently said he prefers Snooki to the TLC stars. “Do you know who Mitt Romney is?” asked Jimmy Kimmel. “No,” replied Honey Boo Boo. Jimmy Kimmel thne asked who she would be supporting this year. “Marack Obama,” she replied, as Mama adjusted her daughter’s legs into a more ladylike position, an ongoing struggle between the pair during the segment. Nine minutes later and the youngster jumped for joy when she realized it was over. “You better Redneckognize!” she yelled.